Once in a while I lure our godson which is not difficult especially if it involves pizza tasting. 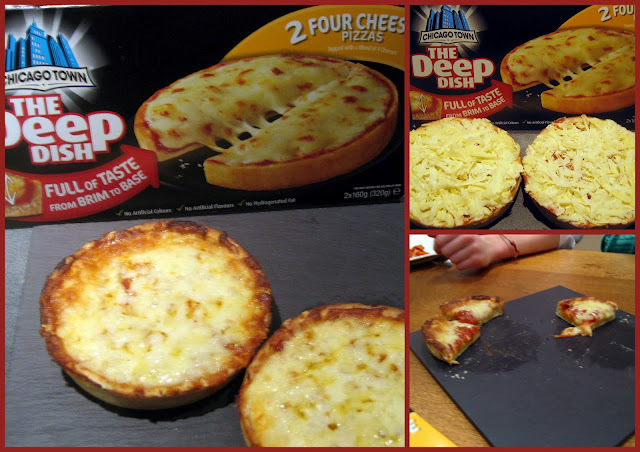 At the grand old age of 17, he is a "trained expert", he knows exactly what he likes, the perfect person for this review of Dr Oetker's Chicago Town pizza three ranges, Edge to Edge, Take Away, Deep Dish. We have a routine, we taste, we mark, we comment, we taste some more and I report to you. On this occasion, another taster joined the usual crew: Godson's grand-mother, known as Grandi. The evening started to look like a Italian family affair, reinforced by the fact that the motto of the first pizza is, "This pizza isn't for sharing." First, on the menu: The Deep Dish, two Four Cheese Pizzas. Two, because there are two (160g pizzas) in a packet. Last year, Which? published a report on how healthy frozen pizza are. Chicago Town range was reported for its calories content. The companie retorked that the pizzas were more calorific as they have more ingredients than others. Each Four cheese contains 432Kcal. I hope Dr Oetker will keep the offer price for a while, for you to try. I thought this pizza tasted nice. 20 minutes in the oven, then it comes out oozing with melted cheeses, it is not called deep dish for nothing. It also has a thin crust edge. One bémol came from Grandi, "The bottom is bready." It was our top scorer for the evening with 6.5 out of 10. Last but not least I had chosen an Edge to Edge Deep Pan Miami Meaty Pizza. A pizza which claims to have more topping than any other pizza. It surely makes the most of the base as the topping really goes up to the edge. As you can imagine this was debated at length, everyone staying on their position.